Willy Wonka, fictional character as created by Roald Dahl, is no stranger to toys. He's been made a few times, but just never quite in the form fans want the most, i.e. Gene Wilder. The star of the 1971 musical Willy Wonka and the Chocolate Factory may not have had the goatee the character sported in Roald Dahl's books, but he embodied the perfect blend of fatherliness and periodic deception with occasional irresponsibility. Wilder has sadly left us, but a new toy company called Molecule8 has created an eerily lifelike headsculpt for their upcoming Willy Wonka figure, coming this December. Created from a combination of digital modeling and traditional sculpting, the figure nails Wilder's poker face. A second head captures him in a more smiley moment. You know what this means, right? 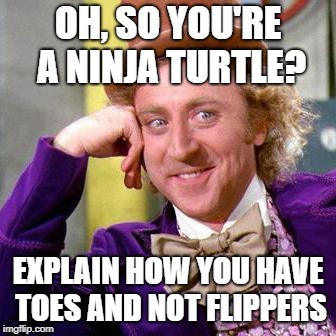 Shoot your own toy-inspired condescending Wonka memes! This fancy footwear will even contain hidden magnets to attach him to the included display base. Mr. Wonka is up for preorder now, with a price tag of $249.99, which is probably less than it costs to make a real golden ticket. If sales are truly scrumdidilyumptious, perhaps we can get some Oompa Loompas next, and live in happiness too. Is your wild collection ready to get Wilder? Leave us a comment below, because yeah, that's the ticket!